We address the problem of quantifying myocardial deformations from tagged MRI sequences. 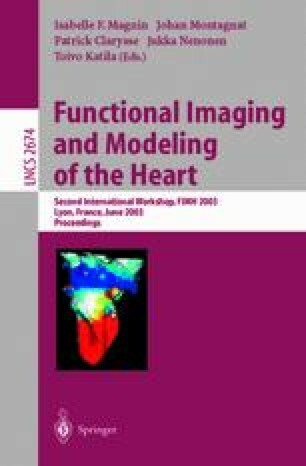 We develop a two-step method comprising (i) a motion estimation step using a novel variational non rigid registration technique based on generalized information measures, and (ii) a measurement step, yielding local and segmental deformation parameters over the whole myocardium. Experiments performed on healthy and pathological data originating from various imaging devices demonstrate that this method delivers, within a reasonable computation time and in a robust and fully unsupervised way, reliable measurements for normal subjects and provide quantitative pathology-specific information.